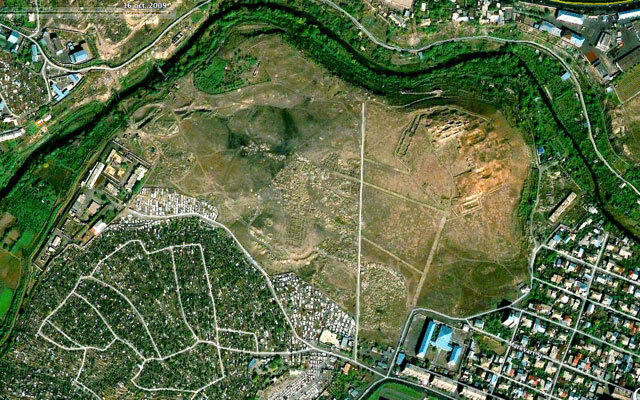 YEREVAN—A massive cemetery found as a result of three years of archaeological excavations in the ancient site of Karmir Blur (Red Hill) in Yerevan is of huge scientific significance, says Hakob Simonyan, head of the expedition and Director of the Historical Cultural Heritage research center of the Ministry of Culture. According to him, the archaeological materials found at the site could give an answer to a number of questions about the residents of the area, their perceptions of the afterlife and their burial rituals. Karmir Blur or Teishebaini, which is presently located near the city of Yerevan, was a provincial capital of the 9th to 6th century B.C. Kingdom of Van (better known as Urartu). Hakob Simonyan says the Kingdom of Van has always been in the spotlight of scientists. However, no graveyard had ever been found on the huge territory until the decision was made to construct a highway bypassing Yerevan, which could only pass through Karmir Blur. As a result of three months of research, scholars have found densely located tombs. There are 500 tombs just under the road being constructed. The kings of Van viewed the Ararat Valley as a granary, where the finest wines were produced. Hakob Simonyan says half a million liters of wine was kept in the pantries of Karmir Blur. Huge reserves of grain were also kept in the city. Among the most important items found at the site were the “four idols” – tuff tiles with holes in the shape of eyes. Scientists assume the idols protected the peace of the dead. It’s now unclear whether the people buried in the cemetery were from the same family, nationality or represented completely different ethnic groups. The answer to this question will become clear after a DNA test. Samples have already been sent to Copenhagen. According to Hakob Simonyan, Karmir Blur contains exceptional archaeological material, which could give answers to a number of questions. He says as many as 5,000 artifacts could be found at the site. Where they will be kept is a different question. Scholars are confident that it’s high time for Armenia – a country with a powerful cultural heritage – to have Anthropological and Urartian Centers. As for the excavations at Karmir Blur, Hakob Simonyan says both the Eurasian Bank and Yerevan City Hall have promised that no historic monument will be destroyed and the road will be constructed only after the area is fully investigated.